FileMan generates its own directory (folder) on your web server, with the correct permissions already applied. This means that FileMan is both quick and easy to get working on a supported shared or dedicated web server. Most importantly, the file directory is kept separate from RapidWeaver; therefore RapidWeaver will never inadvertently change or delete files when a website is republished. As mentioned already, you can link to files in FileMan using a wide range of our stacks. Uploading and deleting of files can be toggled on and off in the FileMan stack settings. FileMan is able to generate new folders within your main directory. And if you intend for a non-English speaking person to use FileMan on a website; then all the localisations can be customised to any language of your choice. FileMan supports a single user account (password). The file upload interface is purposefully fast, simple and uncluttered. Support for HTML5 drag and dropped file uploads further enhances the user experience. It is possible to iFrame FileMan inside FancyViewer or TopBox lightbox stacks. File uploading currently works on all desktop web browsers and Android. All newer web browsers and devices (including iOS) are able to browse and delete files. As well as working as a backend file manger, FileMan is also great to use for displaying a public list of file downloads on your website, like images, documents and PDF files. This makes FileMan perfect for use as a warehouse or digital archive. The FileMan login and file management interface has been improved to make it mobile-first responsive. Styling of the interface is accomplished using Twitter Bootstrap. Clicking table headings allows you to sort the files into a different order. You can disable the password option in FileMan, by leaving the Password setting empty. Once FileMan has run on your server and configured itself, login to your web hosting control panel. Go into the security settings and opt to password protect the FileMan directory. This will create a .htaccess file with Apache, and require a username / password combination from the user. It is possible to create multiple usernames and password combination using this method. Just remember that this method of password protection will also take effect on all files stored within the directory (so they will not be available to use in other stacks like ProGallery or RefinedSlider). 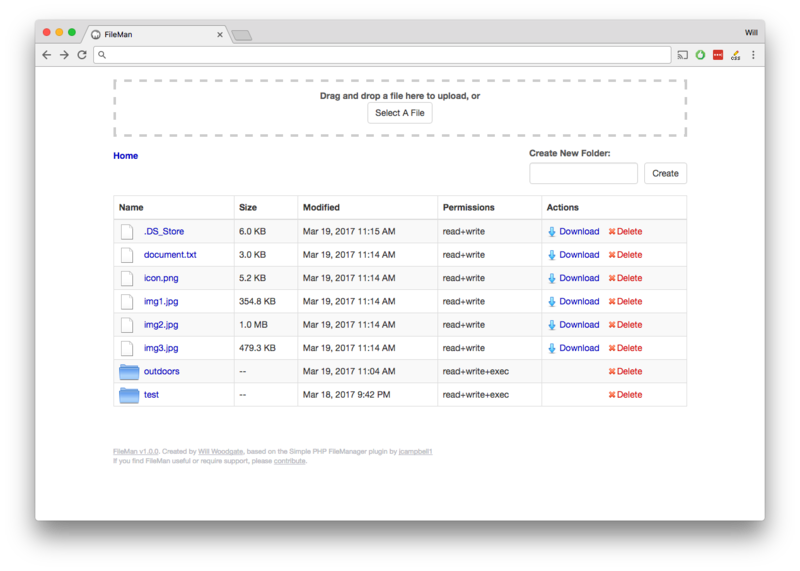 Derived from the simple PHP file manager plugin, FileMan is a free stack to provide a basic login and file management interface on your RapidWeaver website. This stack is absolutely perfect for use in instances like providing a client with access to login and manage their photos in ProGallery / RefinedSlider or for management of MP3 files in PlayLister. Fileman has a multitude of innovative, potential uses and works brilliantly well with many of our stacks.